This is a statement I hear every once in a while around town. And like many of the statements flying around between political parties this fall, there is a kernel of truth and more than a bit of exaggeration. 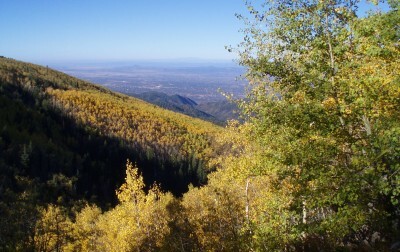 Aspens (Populus tremuloides) are indeed a species that has a shared root system between many trunks. Those root systems can be thought of as the individual and the trunks as branches (which are called rametes by biologists). The whole grouping or “clone” shares genetics, gender and to a large degree nutrition. A bright green stripe among changing neighbors–a probable clone? This is a huge advantage to the plant in several circumstances. When an area has been cleared by windstorm or fire, the underlying root system can spring to life and send up shoots within weeks of the extra sunlight reaching the ground. This process can occur at any time during the growing season–not just when seeds are shed in mid-summer. Since the little shoots are supported by an established root, they can grow very quickly and recover from some serious injuries along the way to becoming contributing members to the system. This pattern of growth and spread means that over the years an individual can cover a large area. 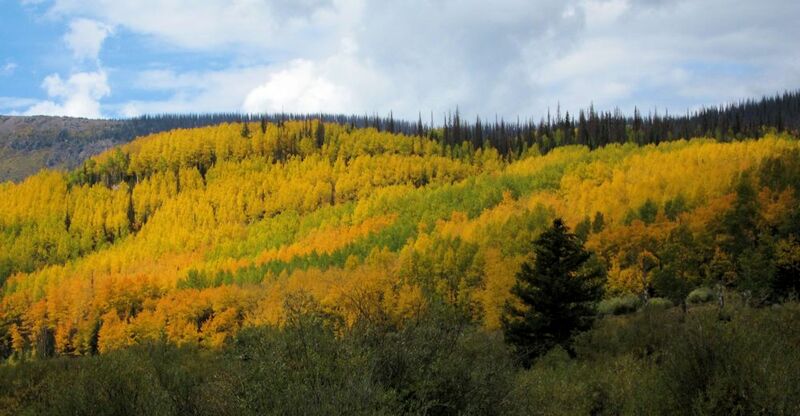 The world’s largest proven clone is named Pando (Latin for “I spread”) and covers just over 106 acres in the Wasatch Mountains of Utah. To prove it’s size, researchers sampled and genetically tested over 200 stems to outline the boundaries of the clone. However, they also found over 40 other genets or clones within their sample area illustrating that boundaries are not regular or well-defined. Indeed other researchers have found areas (even in small aspen stands) of complete overlap between clones where particular trunks are not related at all to immediately adjacent trunks. 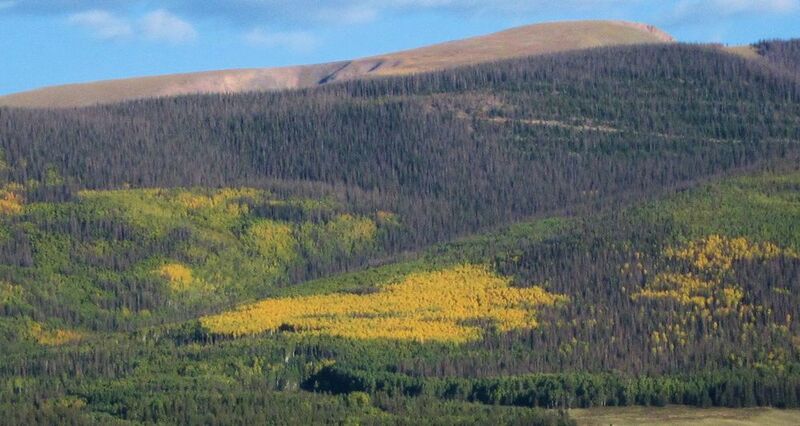 A probable Aspen clone colors a slope. For those unwilling to do the rigorous laboratory testing, there are clues however. In springtime when trees are leafing out or now as they begin to turn their fall colors, it can be possible to see distinct patches of color where the leaves of all the trunks are changing at once. Especially when a patch runs up and down a slope and not following an elevation line, it can be conjectured to be a single clone. So are all the aspens on the ski mountain connected? Probably not, but neither are they all individual trees, either. Biological truth and life are more complicated and interesting than that. Come on an Outspire hike and see for yourself. This entry was posted in Flowers&Fauna, Plants and tagged aspen, aspens, Forest, nature, New Mexico, outdoors, Populus, Santa Fe, tree, trees, wild plants. Bookmark the permalink. Thank you so much! Of course you know that it’s almost impossible to take a bad photo around Santa Fe!